Critical care nurses work with patients dealing with very serious medical issues, and if you want to become a critical care nurse, you need to understand the difficulties associated with the job. Working on ICU floors and in other locations means that you might see your patients dying every few days even with proper care. Nurses also work closely with the loved ones of a critical patient, helping them make rough decisions about the future and explaining a patient’s condition. If you want to work in the field, you need to start with college. 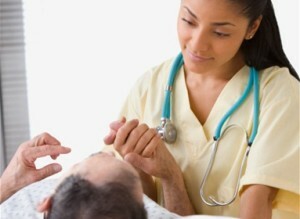 According to the American Association of Critical Care Nurses, those working in the field must have a nursing degree. The AACCN recommends that critical care nurses complete an associate’s degree, a diploma program, an RN program or a BSN program, which is a Bachelor of Science in Nursing degree. While still in college, you must complete a certain number of hours performing clinical rotations. Those rotations let you practice your skills, talk with patients, take vital statistics and perform other nursing duties. The NCLEX examination is the most important test that you’ll take throughout your career. This test covers more than 200 questions and asks for your response on ethical questions. You’ll also receive questions about different types of medications, how to use equipment and the symptoms of various diseases. Prior to taking the test, you must pass a criminal background check and submit your fingerprints to the local police department. Those who pass the test receive their nursing licenses. If you fail the test, you must wait a specified period of time before applying to take it again. To become a critical care nurse, you need nursing experience. Most hospitals will not hire recent graduates, and many other medical centers will only hire nurses with a few years of experience. Even if you can find a job at a hospital, you’ll likely spend a few years working on other floors until making your way up to the critical care floor. One of the best ways to gain the experience that you need is with a job at a retirement home, a nursing home or a hospice facility. Hospice facilities keep patients comfortable during their last few weeks or months. You’ll have the chance to show that you can handle both the duties and stresses of the job. The American Association of Critical Care Nurses is responsible for granting certificates to nurses working with critical care patients. Prior to obtaining your Acute Care Nurse Practitioner Certification, you must gain a certain number of hours in the field, pass a background test and demonstrate that you have experience working with acute care patients. After meeting those requirements, you can apply to take the licensing examination. Though not all employers require that applicants have certification, getting your certificate can help you become a critical care nurse. Nursing is a stressful job field, and those working with acute care and terminally ill patients experience more stress than other types of nurses do. If you can handle the stress and issues of working with those patients, you’ll need to obtain your degree, pass your licensing examination and gain some experience to become a critical care nurse.